First edition, Simon & Schuster, New York, hardcover, 1996; Touchstone paperback 1997; Mainstream, London & Edinburgh 1998; Kadokawa Haruki Jimusho, Tokyo 1998; Hainan, China 2001. 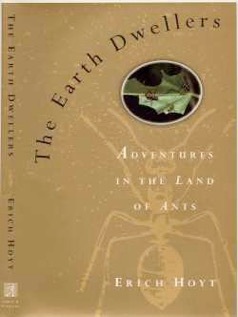 "A fascinating account of ants and their treasure hunters: we have much to learn about life from both." "Too often, works about the wonders of the living world focus on mammals and birds. They seem more like us. Hoyt's narrative switches back and forth between ants' view of their world, and our view of them (or, more specifically, the view of the two most distinguished ant-studiers of recent times, E. O. Wilson and W. L. Brown). This is an unusual and provocative book, but ultimately a most rewarding one." — Prof. Sir Robert May, AC, FRS, University of Oxford, Chief Scientific Adviser, UK Govt. "Almost like science fiction. Hoyt makes this [strange world] intelligible and fascinating." "The Earth Dwellers is a scientifically serious but fun-reading wallow in natural history. Hoyt, writing as if he is rummaging through one of nature's most fascinating mysteries, likes a point blank approach. And it's this quality that draws the reader into the ant world with bug-eyed interest. In his exceptional ant close-up, wonder is the main ingredient of the book. Mesmerizing!" "Nicely complements E.O. Wilson and Bert Hölldobler's own writing on ants and the rain forest... Recommended." "Why is it that we are fixated on our spheres of magnitude, the one of man, sheep and horses, when there dwells amongst us, roughly two powers of ten smaller than us, a whole cosmos of the most thrilling and highly organised creatures one can think of? Erich Hoyt leads us skilfully and with considerable wit into the world of ants, making fictional tales of extraterrestrial life bland by comparison. Intricate and fascinating, this book is not least an important contribution to conservation understanding."